The same article cites statistics asserting the video “has attracted 70 million views and appeared on thousands of online accounts.” Involuntarily humming the song demonstrates the power of an “ear worm,” a song you can’t get out of your head, and is an example of the power of culture to captivate people’s minds, and maybe even hearts, for better or worse. This amounts to the promotion of China’s sphere of influence as a “comprehensive strategic partnership” involving mutually beneficial business, couched within the engagement of leaders in seemingly less serious “cultural” exchange. Such cultural trappings may be interpreted as the froth of more serious diplomatic engagement, but on a deeper semiotic level, it functions to key readers to a narrative latent with symbolic importance. In the current context of Xi Jinping’s recent drive to use pop culture to promote his “Four Comprehensives,” the secondary objective of the campaign is to raise the president’s profile and thus contribute to his accumulation of cultural capital. The archery picture at the Sino-Mongolian summit in August 2014 was taken a year-and-a-half before the current Spring 2016 campaign. Looking back, it appears the soft power campaign started long before the current employment of rap propaganda. The archery picture can be read as a metaphor, a reenactment of a symbol of ethnic nationalism and inter-ethnic cooperation and brotherhood, reprising the myth of martial arts hero Guo Jing, the main character in Jin Yong’s famous epic novel, The Eagle-Shooting Heroes [She diao yingxiong zhuan] 射雕英雄传 (English title from the 1987 Yuanliu Publishing collected works edition, Taiwan). 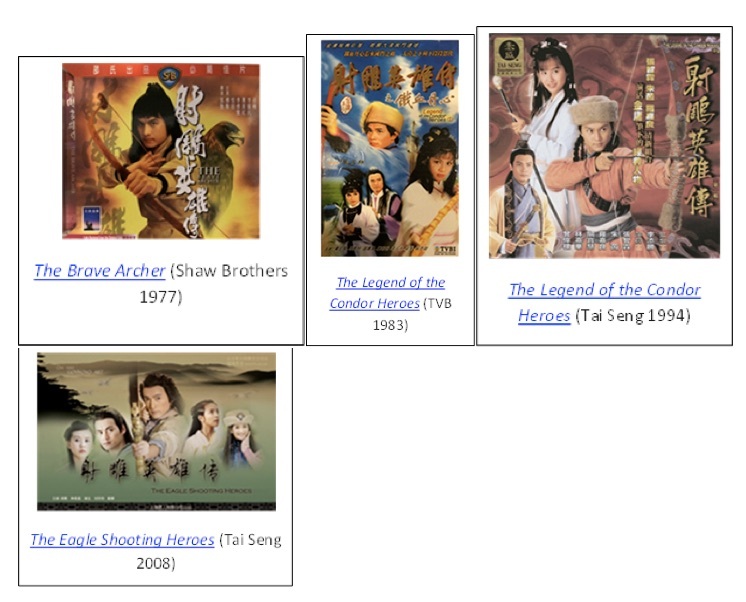 The various English titles of the novel and multiple television series adaptations laud the shooter as “hero” or refer to “bravery,” a reasonable translation of the Chinese, in which “hero” appears in the title and “bravery” applies to the protagonist’s character. The cultural symbolism of the “eagle shooting pose” that Xi adopted for the Sino-Mongolian Summit camera can be read as directly referring to the famous scene from the novel and film/television depictions where protagonist Guo Jing proves himself worthy of Genghis Khan’s notice through his archery by shooting eagles (or condors, depending on the choice of translation) out of the sky on a hunting trip. A short list of television and film adaptations of this novel includes: The Legend of the Condor Heroes (TVB 1983), The Brave Archer (Shaw Brothers 1977), The Legend of the Condor Heroes (Tai Seng 1994), The Eagle-Shooting Heroes (2008). “Moral rectitude” is the first order of identification that could benefit Xi Jinping’s image, particularly since he has been fighting corruption on many fronts since the fall of Bo Xilai. In this view, President Xi’s pose consciously (or unconsciously) mirrors that of Guo Jing, depicted in these four cover photos. Xi Jinping cleverly positions himself as a symbol with which his pop culturally informed Chinese audience may identify. He is a Han national hero, like Guo Jing. What kind of identification is this? First consider the power of the pop culture icon. The degree of identification hinges on the cultural penetration of the image Guo Jing, whose character is propagated first through the popular novel, then by way of television and film adaptations, and finally by virtue of the stature of the novel’s author, Jin Yong. For those Western readers not familiar with this dimension of Chinese culture, author Jin Yong and his character Guo Jing are comparable to J.K. Rowling and Harry Potter. Virtually everyone alive in the last two decades can conjure a picture of Harry Potter. Guo Jing’s existence and cultural penetration are equally well established. Although Guo Jing’s martial arts/swordsman dimension might be more akin in Western terms to Alexandre Dumas’ The Three Musketeers and his protagonist d’Artagnan, the temporal immediacy of Harry Potter fits the pop culture analogy closer. So who is Guo Jing? As the story goes, he was raised in Mongol society, became the adopted son of Genghis Khan, the blood brother of the Khan’s son, and engaged to his daughter. Guo Jing is the kind of hero who is famous not merely for his martial ability, but also because his prime character virtues are uprightness, honesty, and loyalty. Throughout Jin Yong’s narrative, Guo Jing relies on these virtues while negotiating difficult terrain in his coming of age, learning kung fu arts, falling in love with the clever Huang Rong, also of Han heritage (and breaking off his engagement with Khan’s daughter), and eventually defending the Song against both the Jurchens 女真人 and the Mongols 蒙古人. Guo’s upright, straightforward, hardworking, loyal nature simultaneously facilitates close fraternal (albeit adoptive) ties with the Mongol clan that raised him and ethnic allegiance to his Chinese roots. Eventually (it is a long story of 1,600 pages), Guo Jing defends the Song against foreign incursion, but maintains his integrity in all his relationships despite significant interior and exterior conflict. The novel The Eagle-Shooting Heroes was written in installments and serialized in the Hong Kong newspaper Hong Kong Commercial Daily 香港商報 from 1957 to 1959, and its sequel was continued in Ming Pao 明報, which was founded by Louis Cha (Zha Liangyong 查良镛). The author and newsman are one in the same – Cha’s pen name is Jin Yong. 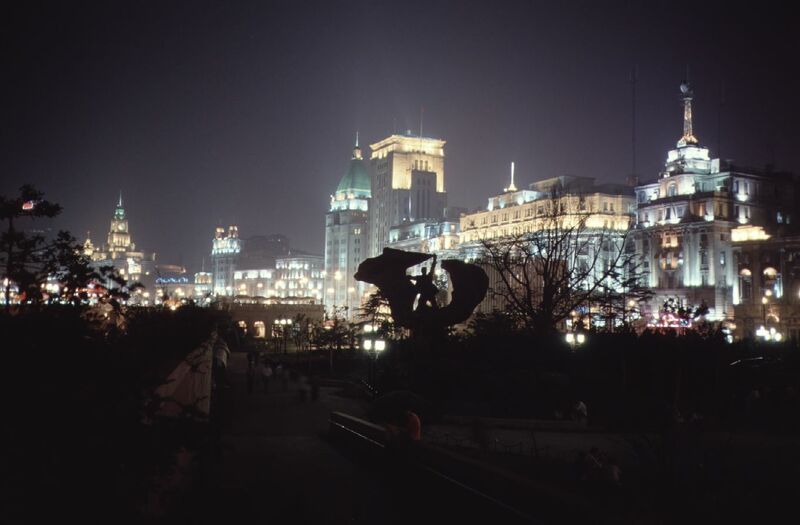 The first film version in Hong Kong was made in 1958, and later film adaptations were made in the 1970s, 1980s, and 1990s. 6 The 1983 TVB television adaptation, titled in English The Legend of the Condor Heroes, was made in Hong Kong and starred Huang Rihua (Felix Wong) and Weng Meiling (Barbara Yung). It spanned 59 episodes, and was a social phenomenon at the time, garnering an incredible 99 percent viewership in Hong Kong, and was rebroadcast in 1985, 1990, 1995, 2012, and 2013 (in Taiwan). This adaptation continues to hold its own in pop cultural consciousness. 7 Jin Yong’s books were not available in Maoist mainland China, where politics tightly controlled cultural production, especially during the Cultural Revolution of the 1960s and 1970s. The TVB production time frame of 1983 is coincidental with the early years – shortly after Deng Xiaoping opened up China to the outside world – which were characterized by the massive importation of “Gang-Tai (Hong Kong and Taiwanese) popular culture in the 1980s.” 8 This “pop culture craze” was specifically marked by a trio of cultural producers and their products: Jin Yong and Qiong Yao’s novels and Deng Lijun’s songs. While Jin Yong had become enormously wealthy and influential as a Hong Kong newspaper publisher, his pop cultural impact was most deeply felt through serial publication of his 12 major novels, the revision and publication of those installments as books, and three collected works editions, as well as the multiple adaptations of each of his stories for television and film. He was so widely read in China that “the head of the National Publishing Bureau is reported to have told Jin Yong that in 1985 alone 40 million volumes of his fiction were sold in the Chinese mainland.” 9 In fact, the breadth and penetration of Jin Yong’s novels and characters in the cultural consciousness are so deep that there are a handful of other characters who are equally recognizable as Guo Jing to the Chinese readership. The 1983 adaptation of The Legend of the Condor Heroes in 59 episodes is considered the definitive classic version by the generation of Chinese currently in their 50s and 60s, both inside and outside of China. This adaptation is listed variously as the ninth most popular TV series in the Chinese diaspora according to one source, 10 as well as the number five television series in mainland China, with a viewership rate of 90 percent. 11 Given that there have been four other major adaptations of this work, and a 2017 version is currently in production, it is not surprising that there is a stark generational difference in terms of which edition is preferred. This holds for the multiple adaptations of Jin Yong’s other works, too. For example, my informal discussion with Chinese graduate students at Georgia Tech reveals that students in their late 20s favor more recent adaptations. Guo Jing is simple and plain, even slow as a child, but loyal, upright and honest. Hard work accounts for his attainments. In addition to archery, a skill at which Guo Jing excels, his martial prowess is famed. He learned kung fu moves through a lifetime of diligent practice from a wide variety of upright practitioners, including masters from a virtuous Daoist sect as well as the leader of the largest gang in the martial world, the Beggar Band. The photo of President Xi posing like the hero Guo Jing, may be read as a reference to both the President’s forthright nature and his commitment as the defender of the nation. Here is the picture of a simple, but hard-working, upright and loyal hero, identifying with virtuous ideology (Daoist sect) as well as identification with the common people (Beggar Band), whose martial skills can protect the nation and whose diplomatic prowess as a leader can facilitate cooperation and harmony with China’s external neighbors and domestic ethnic minorities. The archery image documents the closeness of the Sino-Mongolian relationship and echoes Guo Jing as friend and “relative” of the great Genghis Khan. Did President Xi understand the potential pop cultural significance of paying homage through a picture that imbues himself with Guo Jing’s highly laudable virtues? This article was written in preparation for Jin Yong’s 92nd birthday on March 10, 2016, and describes Deng Xiaoping’s invitation to Jin Yong to visit in 1981, which “caused a sensation in Chinese society around the world” [yinqi le quanqiu huaren shehui de hongdong 引起了全球华人社会的轰动] and eventually led to unbanning his books. Subsequently, Jin Yong also met with leaders Hu Yaobang in 1984 and Jiang Zemin in 1993. Since the article doesn’t mention current President Xi Jinping, beyond the Peach Blossom Island citation above, the title of the article may serve two purposes: first, to align President Xi with his predecessors, and second, to associate him with the eminent Jin Yong, who possesses cultural credentials of which any politicians could only dream. On the global stage, the “rise” of China may be cast as a zero-sum gain, incurring the question whether “rising” China implies “falling” of other world powers, particularly the U.S. Is supplanting U.S. global leadership a prerequisite implied by the word “leadership?” Will China’s growing economic and military competitiveness result in enhanced international political competitiveness? In my reading, President Xi’s projection of the image of a Chinese leader situated to protect the nation from outside threats through his identification with Jin Yong’s martial arts hero demonstrates Xi’s cultural savvy: he identifies himself with the upright, honest, loyal defender of the Chinese people, and by extension, their domestic and international interests. Can savvy soft power symbolic acts prove useful on the world stage? Employing rap music to promote President Xi’s signature objectives and the “brave archer” trope may be seen as steps to engage the discourse of soft power, somewhat akin to the attempt to use the linguistic appellation “Uncle Xi” to infer identification with the common folk. 16 How this is received, especially outside China, is another matter. A Washington Post article by Emily Rauhala from September 23, 2015 discusses the use of video to promote the image of President Xi. This article is titled “China’s President Xi is ‘so cute,’ says world’s creepiest propaganda video.” 17 The headline may not be fair to Xi Jinping and may indicate a lack of objectivity. Given that the word “propaganda” is a pejorative in English, is it really necessary to use both the adjectives “creepiest” and “propaganda” in the same headline? It is logical to think that the spouse of a famous singer with particularly close connections to pop culture may influence the production and management of her husband’s popular image. 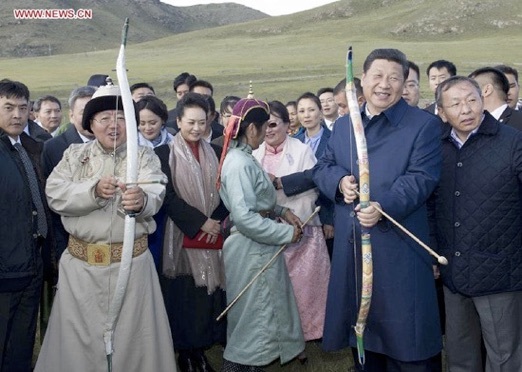 Appropriation of symbolism inherent in pictures like the “archery photo” could be helpful as small building blocks in solidifying Xi’s domestic image. Many questions remain. Since both soft and hard power operate on cultural consciousness, can we prioritize one over the other? Could soft power prove “stronger” than hard military power through its influence over the audiences (think of a Hollywood analogy)? Will overt hard power of nationalism, military or business technocracy dominate the cultural and international discourse? China has many resources and experiences (read “competitive advantages”). And this brings us back to the photo of Xi Jinping shooting the arrow. Is his target, like Guo Jing’s eagle in Jin Yong’s novel, a metaphor for the U.S.? As the second-largest economy on the global stage, China can make a case that its leadership position should be commensurate with its economic position? Will China attempt to displace the U.S. as the world’s leading superpower? Genghis Khan and his descendants established the largest global empire in history in the 13th Century, extending from China to Europe. How will a “comprehensive strategic partnership” between China and its friends unfold in the 21st century? previous post: China Rules the World?